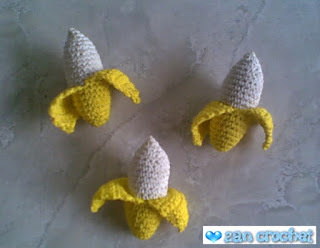 This is a super easy free amigurumi banana pattern. I made these bananas for refrigerator magnets. But, this banana can be anything you like. I am so sorry if my English is good, but I've tried my best to explain the pattern as clear as possible. We will divide the peel to be 2. 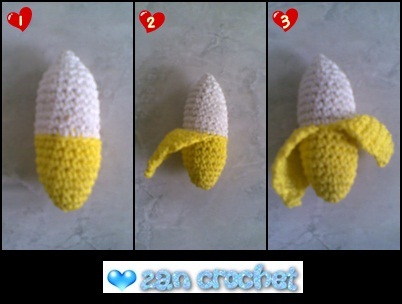 The first side's started from 1st-10th stitches of R10 of banana, and the second side started from 11th-20th stitches. Continue making the second side of peel. Repeat the steps above. This pattern is made by me, Zan Merry. Don’t reprint it to your site or blog. You can sale the ami that you’ve made from this pattern but not the pattern. Thanks. Enjoy this super easy free amigurumi banana pattern.